Take the work out of your morning cup with this SCAA-certified brewer! The OXO Barista Brain 9-Cup Coffee Brewer features an internal processor that carefully monitors brew time, water dispersion and temperature for a just-right pot every time you turn it on. A rainfall-inspired water head and cone shaped brew basket ensure even ground extraction, while its automatic mixing wand stirs a consistently balanced cup. SCAA Certified - A regulated brew temp between 197.6° and 204.8° grants this coffee maker an official SCAA approval rating. Easy Peasy - An easy-to-read backlit LED display and an intuitive single-dial control offer a no-fuss pot every time. Removable Mixing Tube - A built-in mixing wand keeps flavor consistent for the entire carafe. Pause and Pour - Cant wait? An automatic brew pause function lets you fill up your cup mid-brew without spilling coffee all over your counter. Wake-Up Timer - Start your morning off strong (and caffeinated) with the set and forget brew timer. Freshness Countdown - Keep track of your pot's freshness with a built-in 60-minute countdown timer. Insulated Carafe - A double-walled carafe keeps coffee warm without applying extra heat. Just-Right Temperature - As an SCAA certified brewer, the Barista Brain brews between 197.6° and 204.8°, an optimal temperature range for full flavor extraction. 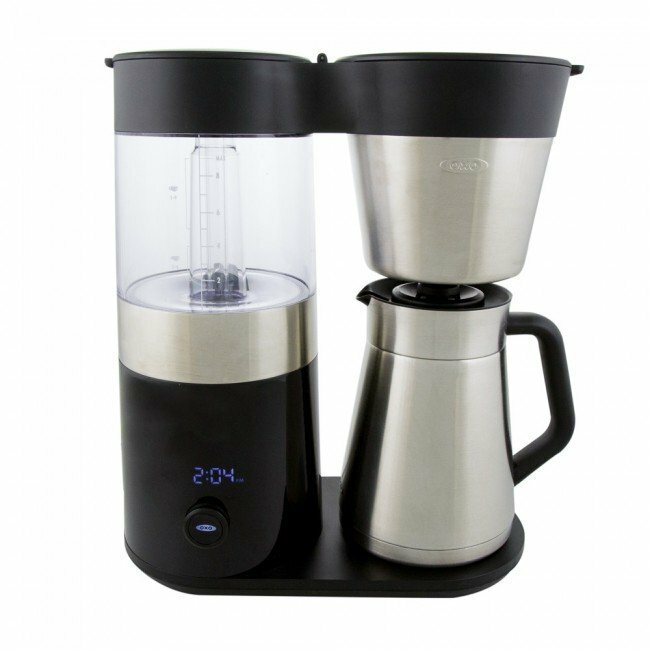 A bevy of effortlessly high-tech features makes the OXO On Barista Brain 9-Cup an easy choice over similarly sized SCAA-rated drip machines like the Bonavita brewer or the Technivorm Moccamaster brewer.